Two large acquisitions over the space of a few months step changes SWK’s capital base in 2017 and should allow the company to push earnings well above expectations, if not in 2017, then in 2018. SWK has a very good track record of buying and integrating similar or adjacent businesses and driving better earnings growth than expected as a consequence – Exhibit 1. The company has a consistent track record of recovering towards a trend return on total capital which suggests that 2018 estimates are too low and 2017 estimates might be too low. The company has bought a high margin business from Newell and a low margin brand from Sears. We expect the upside to be the greatest from the Sears move given potential cost synergies, and revenue opportunities from selling the brand more widely. SWK’s capital base should rise by more than $2.5 billion in 2017 and a return to normalized returns on capital would suggest potential normal earnings of $9.50 versus current consensus 2018 estimates of $7.73. It is unlikely that SWK will close the entire gap by 2018 but we still generate a $155 target price by year end 2017, suggesting almost 30% upside. This target takes no account of any uplift in US sales that might come from an infrastructure stimulus or higher manufacturing growth. Stanley is more exposed to the consumer than to the larger scale construction industry but would still benefit at the margin. SWK has already moved some of its manufacturing base back to the US and this will likely be seen as a positive by the new administration. However, many tools and many parts are still imported and like others SWK may need to raise capex to repatriate more of its product line to capitalize on costs/tax benefits. 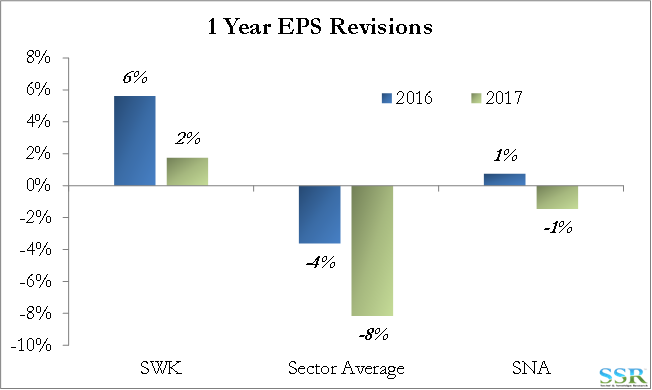 SWK has shown relatively consistent dividend growth and we would expect that to continue through 2017 and 2018. Through these two large acquisitions, the company has provided a growth platform for the next several years – both top and bottom line. 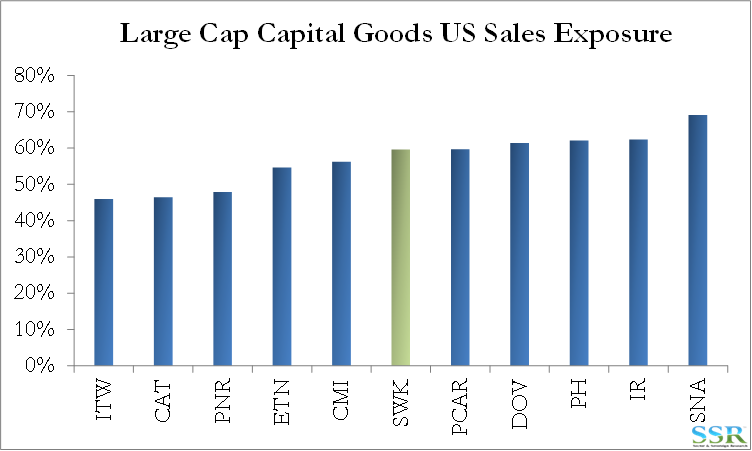 With now more than 60% of its sales in the US, it is less exposed to dollar strengthening and is in the middle of the pack of its large cap Capital Goods peers. Overview – The SSR Industrials and Materials Way! Stanley Black and Decker (SWK) has been one of the best examples of a stock specific research call driven by our “normal value” framework – both proving the value of the process and driving a good stock recommendation. Our methodology looks for good, historically reliable “reversion to mean” stories that are mispriced because they have deviated from their mean. We picked Stanley a couple of years ago because of its consistent “buy-fix-integrate-improve” strategy, which allowed the company to grow its capital and earnings in what is generally a deflationary business – in other words, the fundamental overlay gave us confidence that the pattern would repeat. The additions to the brands and capital base over the last few months suggest that SWK can continue to outperform as long as it sticks to the method and model that has worked for decades. Our methodology initially led us to SWK and gives us confidence that it will continue to outperform. SWK has a very strong history of buying bolt on businesses, growing its capital base, driving synergies and pushing return on capital back towards a trend that implies strong earnings growth and stock performance. With the exception of the foray into security, which in our view was a poorly advised “off-piste” move for the company, SWK has bought businesses that have expanded its core portfolio and then driven synergies and growth from these deals. While the company may have a negative slope to its longer-term return on capital, initially dilutive deals have been fixed, returning the company back to trend – Exhibit 2. The Black and Decker acquisition was followed quickly by the “security” deals and threw the company off track for years, resulting in a period of significant stock underperformance. However, the recent stock and returns trajectory suggests that the company has things back under control. Exhibit 2 shows the issue clearly as the sell side is quick to add the capital base to forward numbers but does – not attribute the earnings opportunity hence the most recent decline in the Exhibit, this lack of confidence in earnings growth, coupled with a realistic but conservative set of guidelines form the company sets up for the earnings surprises that are shown in Exhibit 1. 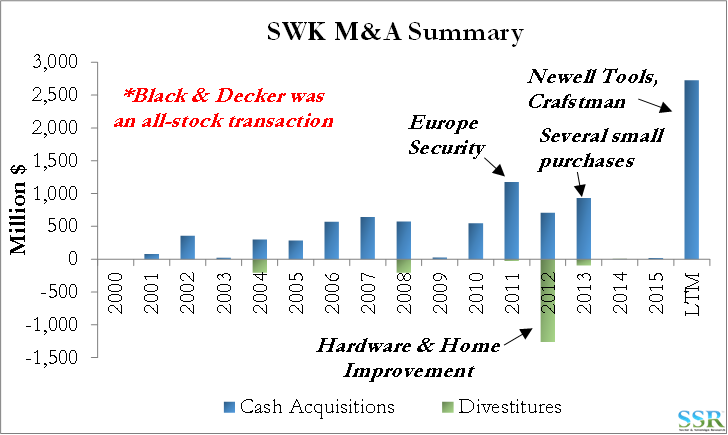 The Newell and Craftsman acquisitions are completely “on-piste” for SWK and we would expect fairly straightforward integration and capitalization of revenue synergies particularly as the Craftsman brand is pushed well beyond the Sears boundaries. As such there should be no issue with assuming that SWK can get to the earnings implied in our return on capital model. These are capital increase driven models and the “steps” are a function of large increases in capital driven by acquisitions – Exhibit 4 – and by the Black and Becker merger, which does not show as an acquisition. The slight downward slope from 2013 to 2015 in Exhibit 3 is a function of the declining ROC trend in Exhibit 2 and no additions to the capital base in those years. The consolidating moves that SWK has made over the last 10 years may allow the company to correct the longer-term decline in return on capital but we are not assuming that in this analysis. 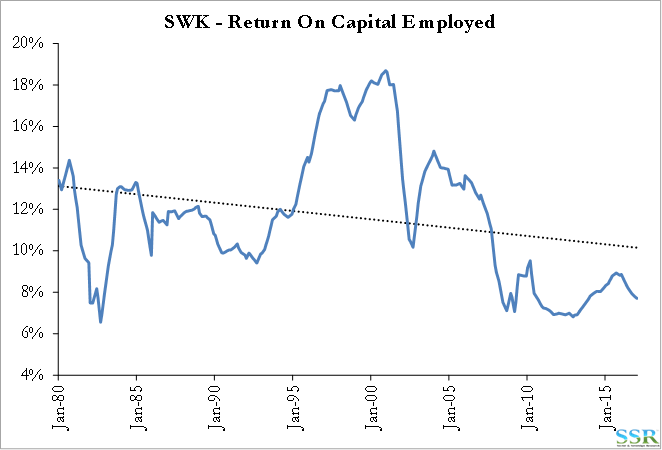 While current trend returns are a little over 10%, SWK’s average since 1980 is 11.6%. A return to this level would add roughly 16% to earnings and our $9.50 estimate based on current capital becomes $11.00. We do not expect to wake up one morning and find SWK trading up 30%, but we do expect the company to keep surprising to the upside, raising its dividend and outperforming as a consequence. The risk would be a need to raise capex to increased US based manufacturing, but that would likely come hand in hand with a lower tax rate or low cost repatriation of offshore cash and so we do not see it as a real risk. 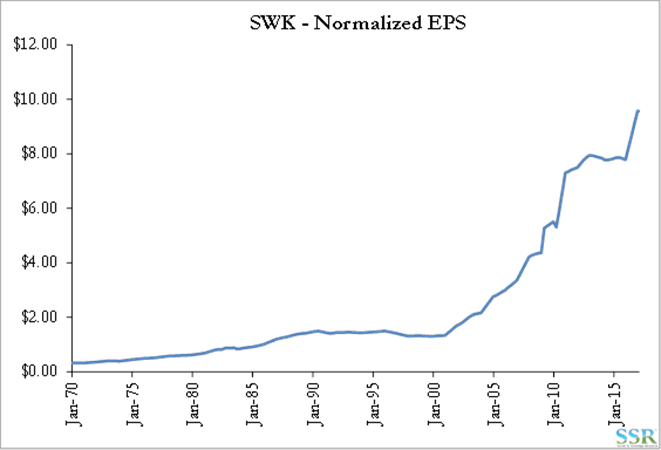 A US recession is the real risk for SWK or anything that drives down US consumer spending. 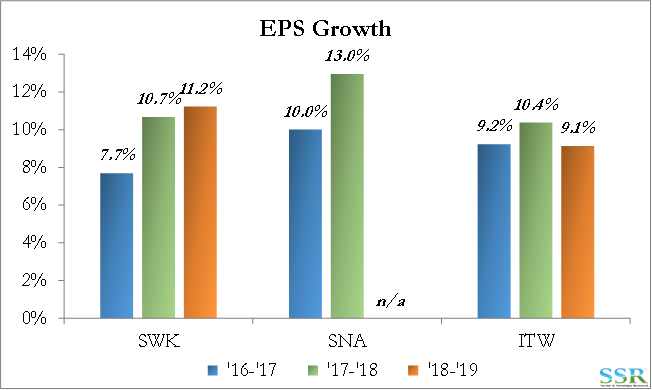 SWK is under-earning versus history, though driving improvements to those earnings and heading back towards trend. The market is pricing the company based on its current earnings and giving no credit for the potential – which in our view is now greatly increased because of the recent acquisitions. 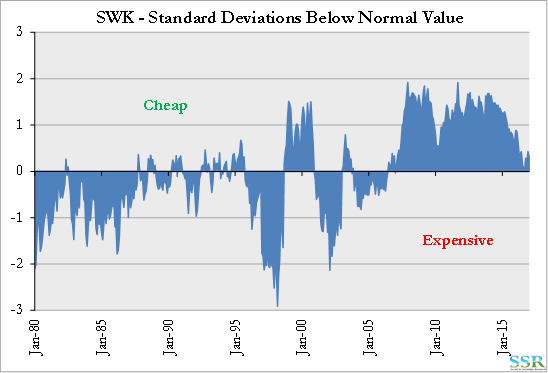 Our normalized valuation work shows the stock to be cheap – Exhibit 5 – but our Skepticism work gives us no information as the current value reflects the current earnings shortfall versus normal – Exhibit 6. The stock has done well in 2016 and is far less cheap than it was, but this has only tracked the improvement in earnings and in our view does not reflect the potential. 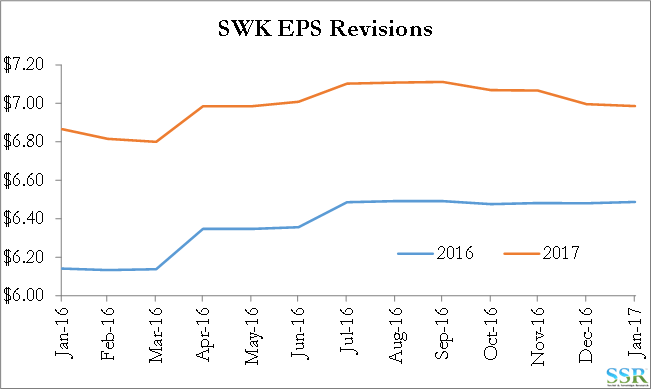 SWK has seen positive earnings surprises in 2016 (Exhibit 7) and revisions have been generally positive (Exhibit 8). However, in our view forward estimates, while they show growth, fail to recognize the opportunity created by the recent deals and while 2017 may be off only a few percent, 2018 could be off by15-20% – Exhibit 9 as outlined above. None of these statements include any potential benefit from stringer US economic growth driven by potential stimulus policies, or lower tax rates. Companies with consistent dividend increases generally outperform their peers with less consistent dividend policies and we have written on this subject previously. 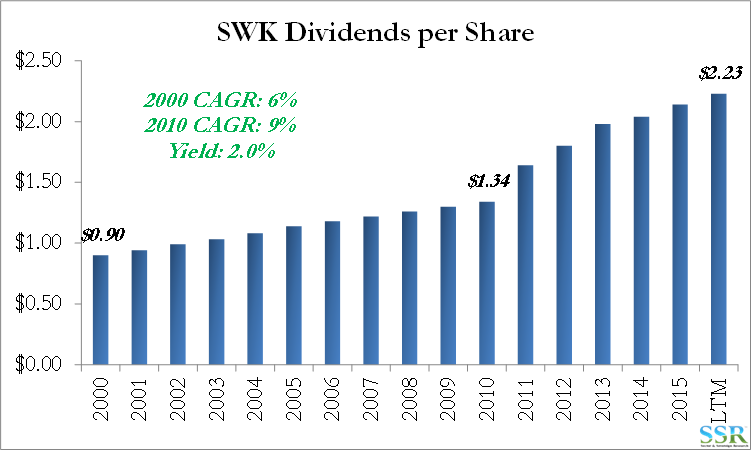 SWK has been quite consistent with its dividend growth (Exhibit 10) and we see no cash flow reasons why this should change – the yield is not high but the consistent discipline is important and once the company has successfully integrated these new businesses there is likely an opportunity to step change the dividend and raise the yield. Separately, the recent deals increase SWK’s US footprint and while they only push the company back into the middle of the middle of the pack versus its peers this may be a positive in a “Trump” world – Exhibit 11.